On this excellent tour, it begins with the collection, by a Tour Guide and transport, from Palace Square. 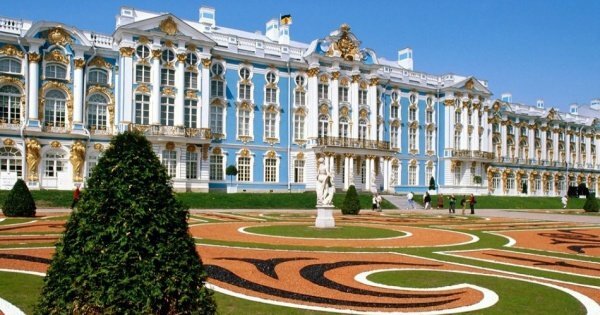 Accompanied by your Tour Guide, wander the opulent halls of Catherine Palace and visit rooms such as the Amber Room which was painstakingly recreated with amber panels, gold leaf and mirrors in a process that took more than two decades. Afterward, spend time strolling in Catherine Park and learning about its impressive landscaping. You will learn the history of the palace construction and redesign by leading imperial architects. Be amazed at the amount of destruction caused during the Second World War, learn about the tedious restoration process and hear the story of the famous Amber Room, how it disappeared and how it was newly recreated by talented amber craftsmen in the local workshops of Trsaskoye Selo.